Charged with restoring harmony and relieving pain, the Malay shaman places his patients in trance and encourages them to express their talents, drives, personality traits—the "Inner Winds" of Malay medical lore—in a kind of performance. These healing ceremonies, formerly viewed by Western anthropologists as exotic curiosities, actually reveal complex multicultural origins and a unique indigenous medical tradition whose psychological content is remarkably relevant to contemporary Western concerns. 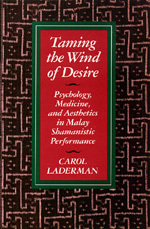 Accepted as apprentice to a Malay shaman, Carol Laderman learned and recorded every aspect of the healing seance and found it comparable in many ways to the traditional dramas of Southeast Asia and of other cultures such as ancient Greece, Japan, and India. The Malay seance is a total performance, complete with audience, stage, props, plot, music, and dance. The players include the patient along with the shaman and his troupe. At the center of the drama are pivotal relationships—among people, between humans and spirits, and within the self. The best of the Malay shamans are superb poets, dramatists, and performers as well as effective healers of body and soul. Carol Laderman is Professor and Chair of the Anthropology Department at the City College of the City University of New York and the author of Wives and Midwives: Childbirth and Nutrition in Rural Malaysia (California, 1984).